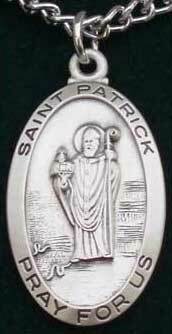 St. Patrick Pray For Us is embossed on this Irish saint medal. This sterling silver Irish saint medal features a detailed embossed depiction of St. Patrick that is enhanced with his staff along with snakes at his feet. The heavy weight and dimensional pendant measures 5/8" wide x 1" tall, including the jump ring and the chain bail. 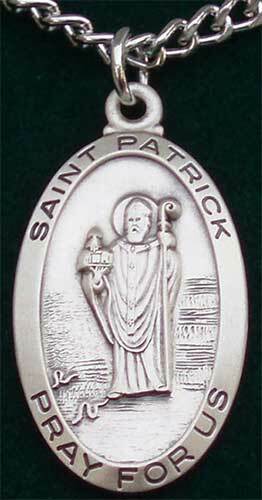 This patron saint of Ireland medal includes a heavy 24" long stainless steel chain and it is made in the United States. The St. Patrick medal, from The Irish Gift House, is received gift boxed.